Sorry... the 2017 Toyota Prius Prime is no longer being sold as new. Instead, take the first step to a great deal on 2019 Toyota Prius Prime with a free price quote! The 2017 Toyota Prius Prime is estimated to achieve the class-topping 120 mpg-equivalent and a 600-mile gas-and-electric range on a full tank and a full charge. The Prime's power comes from an 8.8-kilowatt-hour battery pack for the electric motor combined with a 1.8-liter four-cylinder gas engine, both of which channel their energy through a continuously variable automatic transmission. The Prime will be the first Toyota to feature a dual motor generator drive system, which uses both the electric motor and the generator for drive force, boosting acceleration; it also uses regenerative braking to store energy and reduce fuel consumption.Toyota says the battery can be recharged from empty on a standard 120-volt household outlet in 5.5 hours. On a 240-volt outlet, charging takes less than half that time. While its range and efficiency have grown, so have the Prime's exterior dimensions. 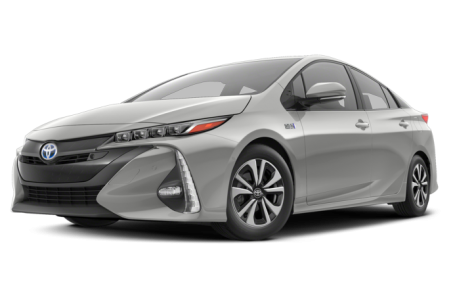 Based on the redesigned Prius, the Prime is 2.4 inches longer and 0.6 inches wider than the previous Prius plug-in; it also sits an inch lower. Toyota says the new dimensions improve cargo space and handling, while aerodynamic shaping and automatic grille shutters reduce wind resistance. Moreover, weight savings come courtesy of an aluminum hood, carbon-fiber elements on the rear hatch and high-tensile steel in other areas. Inside is a cabin-dividing center console, standard 60/40-split folding back seats, standard heated front seats available in synthetic leather, automatic climate control with targeted airflow for maximum efficiency and a smartphone-activated climate-control mechanism that enables the driver to cool the cabin remotely before getting in the car. Other interior features include an 11.6-inch touch-screen for the Entune infotainment system, dual 4.2-inch color displays in the gauge cluster and sound-insulating-laminated glass to reduce wind noise. The Prime will be available with intelligent parking assist, which parallel parks the car or backs it into a space automatically when activated. Advanced safety features will be packaged in the Toyota Safety Sense suite, which includes emergency auto braking with pedestrian detection, lane departure warning with lane keep assist, adaptive cruise control and adaptive high beams; other safety features include a backup camera, blind spot monitor and rear cross-traffic alert.